After the mother's day stamping fun, we are exploring different materials for stamping. This time we used egg cartons and a round sponge for stamping. "In the light of the moon a little egg lay on a leaf." For the night sky, dip Scotch brite sponge in blue paint and make random strokes to cover the whole sheet(you can also use the round sponge). We prefer to use sponge while painting bigger surfaces(as we had done for the Underwater scene). For the moon, dip a round sponge in paint and Stamp the moon. CJ loves to add facial features. She made a smiley face. Paint the tree and the leaves. Finally using a q-tip, add the egg on the leaf. Cut the egg carton as shown in picture 2, Single ones and three in a row. Pour blue paint in a Styrofoam container. 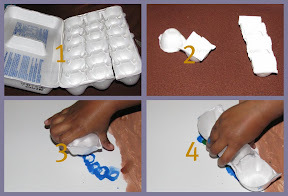 Dip the flat end of egg carton in paint and stamp it on the paper. Complete the caterpillar body shape. To give a multicolor look. Pour green paint and stamp again on top of blue prints. Using single carton, stamp the face of the caterpillar. Let it dry. Meanwhile paint the sun using the round sponge. Using round sponge, Stamp the shape of the cocoon. Add the details of the cocoon. Outline the wings of the butterfly on the egg carton lid as shown above. Cut along the outline to get the shape of the butterfly. Butterfly stamp ready! Using different colors, stamp again on the butterfly wings to get multicolor. When dry, paint the body of the butterfly. Using single egg carton, Stamp the head of the butterfly. When dry add the details of the butterfly, eyes, antennae, legs. Using the single egg carton, we painted polka dots on the wings. Colorful butterfly flapping its wings! CJ arranged the paintings and she read the hungry caterpillar book to her dad. Daddy was very much impressed by her play. THis came out wonderful! What beautiful pictures! I am following you from ABC&123 and wanted to let you know that I have a Showcase Sunday Linky Party for kids crafts & activities & would love for you to stop by and link up some of your fabulous ideas this coming Sunday. These pieces of artwork are beautiful! how fun! love it and will have to do this when my sons are older! How very very beautiful (and how very very patient you are to do all the pictures). Love how you made the egg carton prints. Just perfect!!!! Thanks for sharing on Kids Get Crafty! Much appreciate your visit! Wow this is such a neat stamping idea. It turned out so beautiful as well. I love the idea for egg carton stamping! That is really cute. I love your egg carton stamps. The illustration are wonderful. Thank you for linking to Read.Explore.Learn. Such beautiful artwork. I loved your ideas. Esther, these are beautiful! Featuring this post on this week's High paw. Thanks for participating! thanks for coming & linking up with us at the Sunday Showcase. I will say again that I LOVEd how this turned out. Hope to see you again tomorrow night for the next linky party. The butterfly idea is wonderfull. We make this whit our children. We work in Italy. Ciao ciao! Esther, this is totally beautiful. 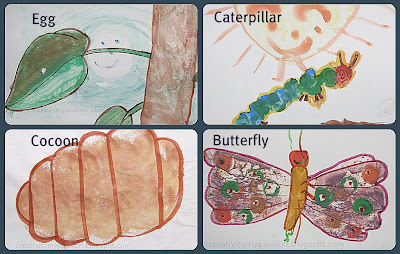 I love how you used so many stamping methods to create these lovely illustrations to go with the book. Especially loved the egg carton stamps to make the caterpillar! This is wonderful! What a great craft. I like the stamping ideas you shared. Ty! That is so cool! (I think you've done my favorite Eric Carle post.) I can not wait to try it out. What a genius way to turn an egg carton into a stamp. The results are beautiful!! Thanks for sharing! Stopping by from the ABC and 123 Show and Tell. A very creative way to encourage children to learn. Well done! I love all the ways to painted. The final product looks great!